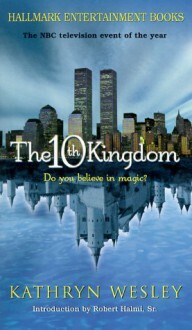 The novel of the BkyB and Hallmark co-venture 'The 10th Kingdom' is a contemporary drama set in a fantasy world where magic and fairy tale characters come to life. This is an Alice in Wonderland for grown-ups and children alike, a witty and satirical reflection of contemporary society told as an epic tale of good versus evil. Follow the thrilling adventures of Virginia and Tony, a father and daughter from New York, who unwittingly find themselves in a parallel universe known as The Nine Kingdoms. Virginia and Tony join forces with a schizophrenic man-wolf, and Prince, a handsome golden retriever formally known as Prince Wendell, grandson of Snow White until his wicked stepmother turned him into a dog. The unlikely heroes then embark on an epic quest to save Prince from the evil Queen and restore him to the throne. This lavish $40 million 10 x 1 hour fantasy drama will be broadcast on Sky One in the UK from Sunday 16th April at 7pm and the next 9 Sunday's thereafter.